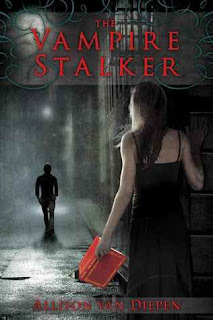 When Christinabean offered me her library copy of Allison van Diepen's The Vampire Stalker, I practically leapt on it. Tried to play it off all cool, but really, I was salivating at the prospect of getting it early (waaaay down the hold list, was I). The whole concept of a book's character coming to life and stepping through into our world entirely intrigued me, so I started reading that very night. Vampire hunter hotties stepping out from the pages of a book? I am SO there. I started off pretty quickly, but gradually.... just... trailed... off. It failed to grab me, and in several instances I just sat looking at the page thinking "Really? Amy just said/did that? Really?" I liked the protagonist Amy, but that was it, just like. The leading man, Alexander Banks, was another OK character. Nothing especially bad or dis-likeable about him, but just plain average as a hero for me. My socks stayed firmly on when I was just waiting for them to get blown off. The characters lacked any real depth for me; it kind of felt like they were moving through the motions simply to get to the next plot point. The intrepid librarian Mrs. P was like a magician with a hat, always pulling out some new skill or knowledge that just happened to toddle the plot along right at that very moment but was never referred to again. Vigo, the bad boy himself, we hardly ever saw. We heard what he got up to occasionally, and Alexander spends almost the whole book hunting him, but he only appeared very occasionally in a very Snidely-Whiplash-esque moment. The plot simply went from point to point, without a lot of development or character insight in between. Overall, I just didn't really enjoy the book. Maybe it was that my expectations were a little too high, but I found it disappointing. I bit in (pun only somewhat intended) expecting a hefty meal, and instead got a light bit of fluff. Sorry, The Vampire Stalker, I'm just not that into you. Don't forget to enter our giveaway! One lucky follower will win Hades by Alexandra Adornetto!! So disappointing when something you're excited about doesn't live up. Great review.